Kewanee, IL - Home of the Boilermakers! 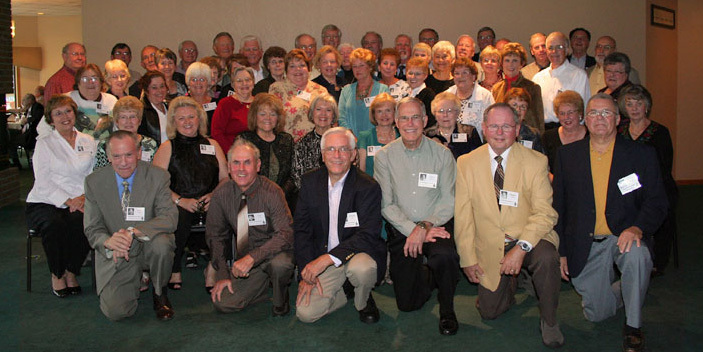 Click here to view 2009 (50th) class picture! 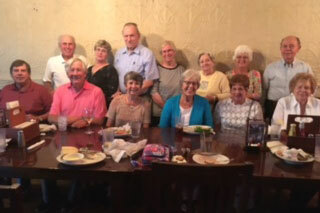 Picture of Classmates 12 p.m. lunch Group at Cernos on October 22, 2018. Randall Lindsey was visiting from California. 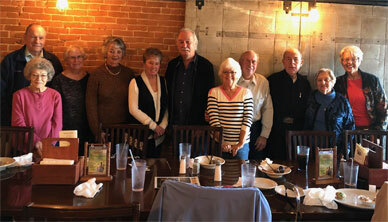 Left to right: John and Carol Kolata, Patricia Wilamowski, Nancy Anderson Parker, Glo Strange Duncan, Randy Lindsey, Jeanne Van Nieuwenhuyse DeConinck, Lee Monroe, LeRoy and Carol DeLathouwer Carpenter, Beth Swanson Taheri. Picture of Classmates 6 p.m. Dinner Group at Cernos on September 14, 2017. Anita Galloway Portner was visiting from Kansas. 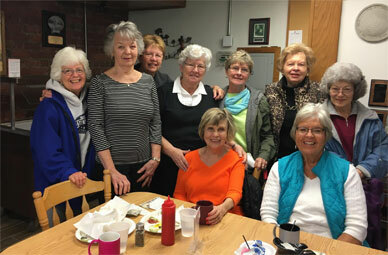 Left to right front row: Lorene Josephson Tuthill, Beth Swanson Taheri, Patti Wilamoski, Pat Grier Tomsic, back row: Nancy Anderson Parker, Carol DeLathouwer Carpenter, LeRoy Carpenter, Anita Galloway Portner, John Kolata, Carol Kolata, Jeanne Van Nieuwenhuyse DeConinck. Picture of Classmates Luncheon Group at Cernos on August 14, 2017. The Johnson's were visiting from North Carolina. 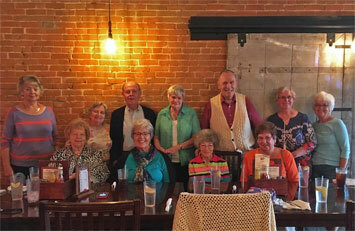 left to right front row: Larry Lyle, Warren Johnson, Cathy Klinetop Johnson, Beth Swanson Taheri, Pat Grier Tomsic, Lorene Josephson Tuthill, back row: Lee Monroe, Kay Duytschaver Heaton, John Kolata, Carol Kolata, Carol DeLathouwer Carpenter, Jeanne Van Nieuwenhuyse DeConinck, Leroy Carpenter. Picture of Classmates Only Luncheon Group at Cernos on July 7, 2017. Picture of Entire Luncheon Group at Cernos on July 7, 2017. Lunch with Bob Smith at Bob's favorite restaurant in El Cajon, Ca. Bob says "hi" to everyone! Notice the size of Charlie's sandwich and you can see why the restaurant is Bob's favorite. 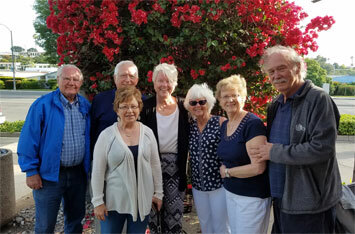 Picture taken before dinner in Escondido, Ca. Our gracious hosts for 3 days were Delores & Randall Lindsey. Delores pictured in front and Randy on the right. At last report the Lindseys survived our visit! 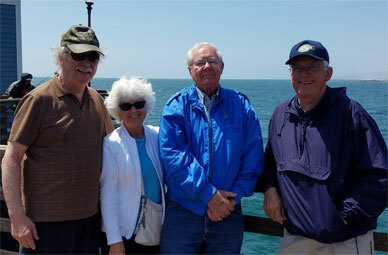 Picture of classmates taken on pier in Oceanside, Ca. 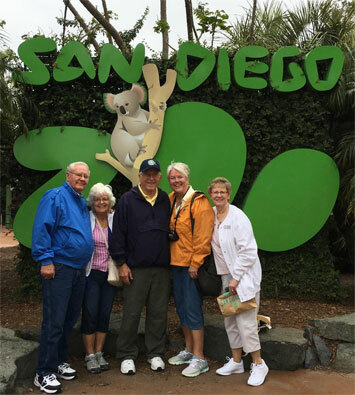 "Grey May" in San Diego area was not helped by temperatures 10 degrees below average. 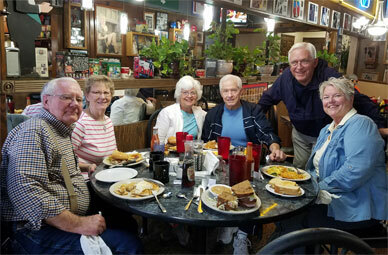 Meanwhile, back in Kewanee, here is a picture of the Class of '59 breakfast group - early May 2017! When entering your classmate profile be sure to check that your profile can only be seen by classmates and not the general public. This site is only for NON-COMMERCIAL use. Simply put, site use is limited to disseminating reunion info to the class and for personal, non business contact between class members. Use of personal information, emailing, etc. for commercial use is strictly prohibited.